April is National Poetry Month, and in honor of the Bard, I’ve been going on a Shakespeare-inspired YA lit tour! You can check out the whole list I’ve gathered here (I haven’t read them all yet, but there’s a whole lot of April left! ), but in the meantime, here are two fun, contemporary reads both set in one of my favorite fictional worlds – high school theater. Megan Harper is pretty sure she’s the real life version of Rosaline, the girl Romeo loved before Juliet. Every guy she dates (and there have been more than a few) finds the perfect girl… right after he dates her. She can’t even really be mad, because, really, how can you get upset about true love? Anyway, Megan has a lot of other stuff going for her – like the fact that she’s a shoe-in for the Southern Oregon Theater Institute’s directing program when she goes to college next year, as long as she can check off that pesky acting requirement. Which should be no problem – next up for her high school’s theater department is Romeo and Juliet, and Megan’s got her eye on the role of Lady Montague. Easy peasy. Until she gets cast as Juliet. Not only has Megan never acted before, but she’s cast opposite her ex-boyfriend, Tyler, who broke up with her for her best friend Madeleine (again, not mad, because they are nauseatingly perfect together). She doesn’t know anything about what it’s like to be anyone’s Juliet. And her drama department is taking R & J to the Shakespeare festival in Ashland this fall, where reps will be evaluating their performances – hers, and her good friend Tyler’s, who’s got his eye on Julliard and is sure his Mercutio monalogue will give him the edge he needs. No pressure. At all. Enter a super cute stagehand, Will, and his aspiring playwright friend, Owen, plus more than a few changes at home, and cue the drama, comedy, and a very crooked path to true love. Emily Wibberley and Austin Siegemund-Broka’s debut novel is fun, flirty, vivacious, and full of so-bad-they’re-good Shakespearean puns – and also just happens to have a ton of heart. 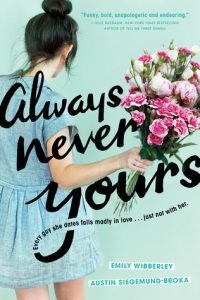 Fans of romantic comedies, don’t miss Always Never Yours! When Claudia finds herself in the bathroom accidentally listening to the break-up of her private prep school’s It Couple, the last thing she wants to do is draw attention to herself (this is basically true all of the time, but especially so in this moment). She gets caught anyway (thanks, phone), and finds herself in Big Trouble with kind-of-scary-especially-when-newly-single Iris. Not a great start to senior year. So, when Claudia and Iris end up as Brit Lit partners, it’s not an ideal situation. Especially when they totally bomb the assignment – due to a basic inability to work together (um, Iris). For a chance to earn extra credit, they can audition for the school play – a production of A Midsummer Night’s Dream. This sounds great to Claudia – there is no possible way she’ll be cast – until she realizes that everyone who auditions who doesn’t get a part is assigned to the stage crew. Which is how she ends up in the costume department, and Iris lands the role of First Fairy, and they’re stuck together for the duration. Still, it’s not all bad. Del, in charge of costume design, is pretty cool. Gideon Prewitt, funny, sweet, larger than life, new friend and maybe more, is playing Oberon. And it turns out that Claudia is actually pretty good at interpreting Shakespeare, which leads to some unexpected connections – including with Iris, who might not be quite as terrifying as everyone thinks. 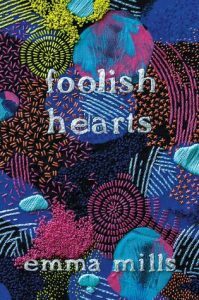 Family and friendships, mistakes and misconception, love and a little Shakespeare all combine to make Foolish Hearts another winner on the YA shelves!